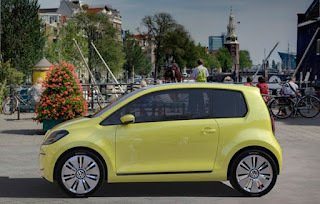 Volkswagen is putting the final touches to a super-economical version of the Up city car, which will be good for at least 95mpg. Expected to be called the Up blue-e-motion, the model will be powered by a production version of the powertrain from the XL1 concept, company sources say. Based on today’s four-cylinder, 1.6-litre VW Group diesel engine, the Up’s twin-cylinder, 800cc turbodiesel is expected to develop just 47bhp, but will be ‘assisted’ by a 26bhp electric motor. The engine’s block is made from aluminium and the bores are plasma coated. It also gets a sophisticated balancer shaft set-up to smooth out the inherently unbalanced two-cylinder layout. The engine and electric motor will be coupled to a seven-speed dual-clutch gearbox. Unlike the XL1, however, the Up blue-e-motion will not be able to travel solely on battery power. That’s because the car’s battery pack will only be large enough to power the electric motor during standing starts or for brief periods of hard acceleration. Energy will be reclaimed during braking to help recharge the battery. The Up is also likely to be equipped with the XL1’s new ‘pulse starting’ feature, which will make the car’s stop-start mode much more seamless. In pulse starting, the electric motor spins the idle engine up to the required speed for its restart, making it virtually undetectable by the driver. When the XL1 is being powered purely by this hybrid diesel engine, it returns 141mpg on the EU test cycle. However, the Up will be at least 300kg heavier than the carbonfibre-bodied XL1 and will have more aerodynamic drag, due to its bigger cabin and much greater frontal area, which means fuel economy will be reduced by about a third when compared with the concept.